NEW DELHI, 4 MAY: Watch out politicians, generation next is tracking you. With the help of social media, youngsters appear to be taking a lot more interest in the country’s election process. The website, www.myneta.info which gives information about criminal cases, assets, liabilities and education of candidates got over 20 lakh “hits” in April during Assembly elections in five states. The number of hits was almost ten times as compared to March. The SMS service of the website operated by Association of Democratic Reforms (ADR) through the number 56070 has also been getting 100 to 1000 messages daily on an average during the ongoing elections. 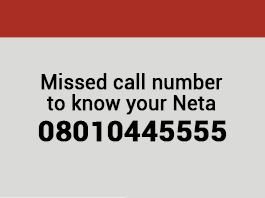 Cell phone users send SMS “MYNETA constituency name” for getting information about the candidates of three main political parties or coalitions in a particular state. The toll free helpline (1-800-110-440) of ADR, which spearheads National Election Watch (NREW), has also been getting a good response. It remains available from Monday to Saturday (from 10 a.m. - 6 p.m.). Callers have been making many enquiries about the candidates in the fray in a particular Assembly constituency. Poll watchers attribute these trends to the increased interest of tech savvy youngsters keen to play a role in the election process. “We (www.myneta.info) have over 13,000 Facebook members in our group. If you see their profile, most of them seem young,” said the information technology (IT) co-coordinator, National Election Watch, Mr Jaskirat Singh. “Our SMS service has also got word of mouth publicity and the queries regarding the candidates range between 100 and 1,000 per day. I think we have responded to a few lakh queries till date,” he added. As part of a voter awareness campaign, the ADR and NEW have launched toll free helpline number (1-800-110-440), myneta.info and the SMS campaign with theme “Sacche ko chune, Acche ko chune (vote for integrity, vote for good people)”. “The world is changing very fast because of the mobile and Internet. Even in remote places people use cell phones if not Internet. The awareness is going up rapidly and the younger generation is thinking about all these issues,” said the founder member of the ADR, Prof Trilochan Sastry. “The younger generation is coming forward for things like the agitation for Lokpal Bill under Mr Anna Hazare. It is sign that they are getting more engaged in society and government and so on. Some of it translates into higher percentage of voting (in Assembly elections) this time,” he added. The ADR and NEW provide information on poll candidates on the basis of affidavits filed by them while submitting their nomination.